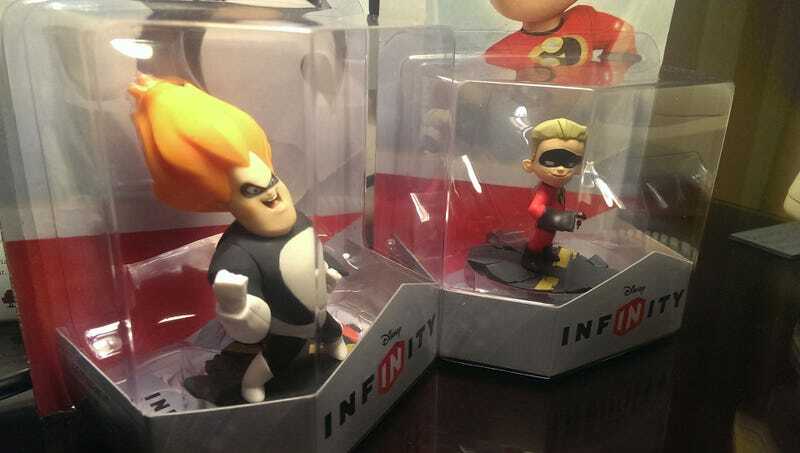 Disney Infinity Is Going To Kill Me. On the way out of my hour-long hands-on with Disney Infinity yesterday, I was handed a bag, and the collector inside me started to shake. They might as well have handed a junkie a tiny bag of crack. There are toy collectors who can just pick up a figure here or there. Maybe they like a Batman figure from a particular line, and they can just casually pick that up. Good for them. If I pick up a Batman figure from a particular line, then I'm going to need to pick up the rest of the figures in the line, because they looks so great on the back of the box together. The urges have mellowed as I've grown older — well, no they haven't. I've just gotten more focused, learned how to narrow my vision to a few select toy lines. Transformers, ponies, Skylanders and — starting next month — Disney Infinity. It's okay, it's for work. I'll tell you folks all about my Disney Infinity experience next week. I'll just say that my biggest worry about the game — that the free-form, build anything Toy Box mode would be too much for its target audience to handle — is no longer a going concern. The concern now is how I am going to keep myself from buying Dash and Syndrome here several dozen friends from across every Disney property, redesigned in a uniform animation style.